on this date in Rory history 12/13..
Re: on this date in Rory history 12/13..
Today exactly 19 years ago...! 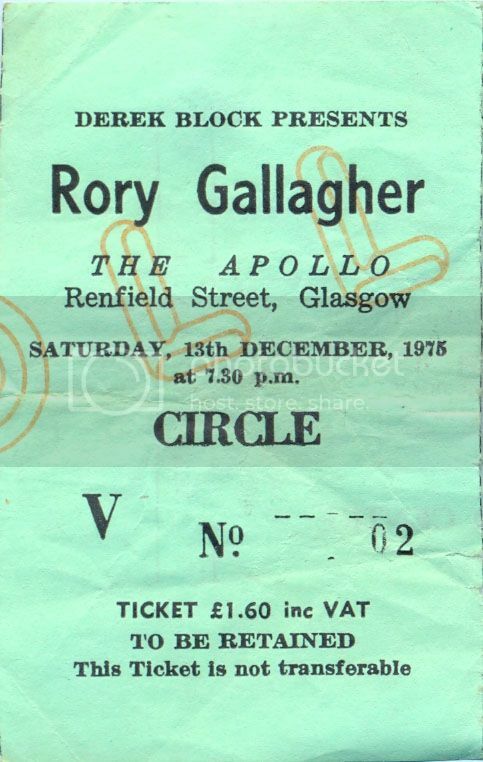 Saturday 13th December 1975, Glasgow Apollo. Another Rory show at Glasgow Apollo. This time I was in a bus load of Dumfries Rory fans going to this show. About 30 of us I think. Just shows Rory's popularity at this time. I went to a football game in the afternoon and then to the show at night. What I remember from this show was the colour of Rory's telecaster. As I was at the back of the balcony I was a good distance from the stage but I am sure it was green, either that or the stage lights showed it up as green. This was at the time when the white telecaster was in for repair and came back painted green. Eventually it was painted black. I think that's the story anyway. Someone can maybe confirm this story and that Rory played it on stage whilst it was green. We were warned by the bus driver that he was leaving at a certain time and would not wait for straglers so there was no waiting at stage door to meet Rory on this occasion. We did speak to Donal, as he was in the balcony at the sound desk, explained we had to catch a bus and then left. 13 December, 2017, No new information to report at this time.